It's Reona's birthday so I did a quick sketch for her. She is fascinated by Native Indian culture. With more time I would have developed it more but it needed to be ready today. Unfortunately I put it under glass before taking the final shot but you get the idea. Budget provisions that barely scratch the surface. What can be said about them? There are around 8,000 teenage parents in NZ and the budget has provided funding for 10 more teenage parent co-ordinators in addition to the existing 9. Around 13,000 inmates leave prison each year and the budget provides funding for 2 halfway houses (whare oranga ake) serving 42. I suppose the ratio of provision is consistent. In both cases around a quarter to a third of a one percent (accepting that teenage co-ordinators will cater for more than one client). Yet the system that encourages teenagers to produce babies that not infrequently go on to become troubled wards of the state and eventually guests of Her Majesty remains intact. The number of people receiving the Unemployment Benefit has dropped by 4,224 over the last month. "That's the single biggest drop in the Unemployment Benefit since the recession began," says Social Development Minister Paula Bennett. 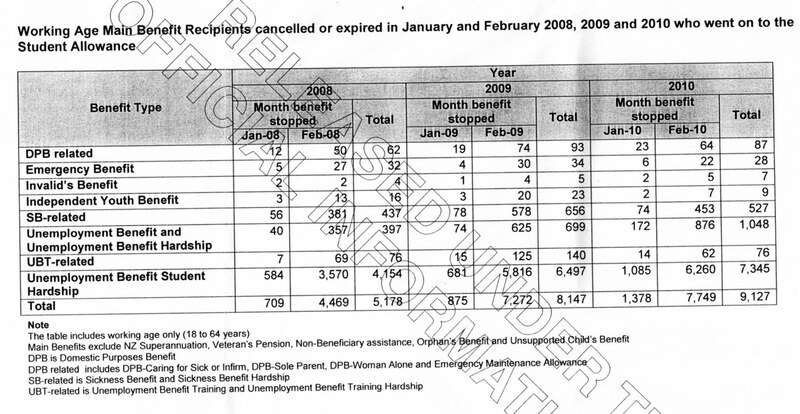 The number of people on all types of benefits has dropped by 10,816 over the same period. Over half of that total number, relates to young people on benefits. Work and Income has continued its work-first approach, using work brokers and its specialised recruitment service Job Connect to match people with jobs. 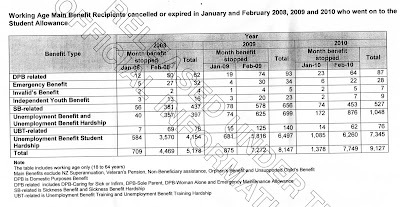 What actually happened was that in February 2010 7,198 people left an unemployment benefit to go on the student allowance. This compares to 3,996 in February 2008. When in opposition National used to rigorously and repeatedly rail at Labour for trying to massage the unemployment numbers. Having spent 9 long years in opposition National certainly had time to observe and learn the art. Yesterday I went to parliament to submit on the Social Assistance (Future Focus) Bill which covers National's latest round of potentially ineffectual welfare reforms. I was there for 2 hours including my own slot of 10 minutes so was witness to many other submissions and the reactions of the committee members. Every submitter I heard was negative about the reforms, most, in a pro-welfare capacity eg there is too much focus on paid work. Before me came the Women's Refuge, The Human Rights Commission, The Christian Council of Social Services, the Presbyterian equivalent, a couple of bodies representing the legal fraternity (Geoffrey Palmer was searingly critical of the complexity of the current social security legislation and further degeneration under this bill), and the Wellington People's Centre. So in the main the usual brothers-in-arms socialists and sold-out-to-the-state religionists. Most stayed on after submitting. So when I eventually spoke the response from in front and behind me was akin to someone farting at the dinner table. I began by reminding the members that the stated aim of the Future Focus Bill is to "break the cycle of welfare dependency" - it was not a response to the recession which a previous submitter had claimed (the Wellington People's Centre, though I don't think I named them). And as the DPB is critical to that cycle I was going to focus on the proposed changes in that area. I had prepared new material for my submission and that was circulated. In brief I urged them to focus their attention where it is needed - young, unskilled, uneducated women entering and remaining in the benefit system for years. I cautioned that the proposed work-testing will not deter this group and could see even more children added to existing benefits as an avoidance tactic. Then I presented MSD information that showed the work-testing regime was less effective than the enhanced case management approach anyway, plus graphic evidence that governments have been fiddling with the DPB since the early 90s to little avail, and urged them to get serious and return welfare to being what was intended - temporary assistance only, except for the most disabled. I finished using the example of Norway where the DPB equivalent is limited to three years after the birth of the youngest child. It wasn't a particularly radical submission. But in the context - all the previous submissions had the left members ( Annette King, Carmel Sepuloni, Rajen Prasad and Catherine Delahunty) falling over themselves to reinforce the sentiments expressed - made it seem extreme. I have submitted to select committees a number of times. But always under the Labour government. Quite often someone would get slightly out of their tree in their reaction. Philip Taito Field for instance (although he was probably under a great deal of stress at the time). Or Alliance's Liz Gordon (now standing for Mayor of Christchurch against her former boss). Did I expect the process to be any different under a centre right government? As I was criticising their bill, no. But I was surprised that whilst I was in attendance for the 2 hours, two of National's members never spoke. Another spoke once. And obviously the Chair, Hekia Parata spoke frequently, but not by way of questioning. The show was being completely dominated by the other side so naturally I was expecting a real grilling. And I wasn't wrong. The thrust of their response to me (excepting Annette King) was welfare dependence is an unfounded and unuseful construct. Rajen Prasad used the term a couple of times in a sneering sort of a way. Where is the work? What about women in violent relationships? Would you go back to the seventies or earlier? Hadn't I been listening to all the other submitters? I told them all I had heard was 'can't do'. And I get tired of hearing 'can't do'. There are existing shortages and looming crises in aged care, disabled care, pre-school care all of which people on the DPB could be filling if they applied some foresight. There were disapproving murmurs behind me which confirmed my suspicion that some advocates for the poor aren't actually looking for work answers but more welfare. Then I began to tackle the escaping from violence objection. Paying people to escape from violence is a double-edged sword. "The DPB is a magnet..." I got no further. Sepuloni and Prasad immediately jumped in wrongly anticipating what I was going to say the DPB is a magnet for young women. And they wouldn't let me continue. I said, you are not listening to me. At which point the chair stepped in and asked Dr Prasad to show me some courtesy and let me finish. The point I was trying to make is that a young woman with a secure income and roof over her head is a magnet for a man who doesn't want to support a partner or a child or a household. These young women are very vulnerable to being preyed on by men with a propensity for violence. (I later emailed each member the documented evidence of this). There was probably more which has become a bit of a blur but I can best describe the episode as a derisive drubbing. And the National members may as well have not been there. But there was something highly unusual about this episode. The submissions were due last Friday. Ordinarily one then expects to wait a few weeks to get a call about a time for oral presentations. Imagine my surprise when it came on Monday. In fact the surface-mailed acknowledgement of my written submission arrived in the letterbox after I had presented my oral submission. Finally one other thing that amused me was Sir Geoffrey Palmer saying that NZ didn't want to go down the same pathway as the US with silly names for legislation. He compared Future Focus to No Child Left Behind. I would very much have liked to chime in that there was absolutely nothing wrong with the name of America's Personal Responsibility and Work Reconciliation Act. What could be wrong with legislating for people to take some individual responsibility for themselves and their children? The Government is preparing to ask some "serious questions" about invalid's and sickness benefits as the jobs crisis eases. Social Development Minister Paula Bennett is flagging dramatic changes to the welfare system over the next few years as the Government has more room to drive through changes after the focus in its first 12 months being mainly on soaring unemployment. "I think in the future how we approach welfare ... I do see that it may look quite different [including] quite a different way in which we approach things and help people to get well and get help and be more employable." Tomorrow's Budget is expected to flag some of the changes, although more fundamental ones are likely to wait until a Welfare Reform Working Group reports back. It was set up to investigate whether the system needs radical change or just tinkering. The idea that the government sets up working groups to discover whether "tinkering" is the answer is ludicrous, but when one considers how they eventually respond to recommendations made, "tinkering" is usually the upshot. While the focus had been on unemployment numbers, meanwhile, they were starting to turn around and would "right themselves pretty much" over time. "It's that invalid's benefit, sickness benefit, that we have to ask ourselves some pretty serious questions about and how and what we want that to look like in 10 years' time." One of the issues was how agencies helped people to get well and back to work. "All we do ... is pay them benefits and put them on training courses and hope they are going to get well. "We are looking at different options at the moment and that is what the welfare working group are doing ... it could mean more [money] up front; spending more to get someone the operation they need, or more drug and alcohol rehabilitation." And Labour didn't try all this stuff? That is exactly what Maharey did yet the numbers dependent continued to rise. This problem is being tackled across the developed world but looks like trying to sculpt with melting ice. Governments herald tough new approaches but to little effect. In the UK and Australia the initial emphasis was on redirecting new applicants into the dole queue. The numbers went up. Now they are reassessing existing claimants or announcing plans to. In the US people on Supplemental Security Income for disability (the uninsured) have been subjected to a great deal of review also. Not surprisingly the US have taken the most stringent approach and at least have numbers tracking in line with the population growth. 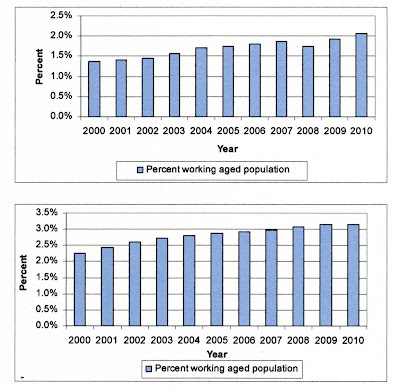 Here numbers on the sickness and invalid's benefit keep rising as a percentage of working age people. 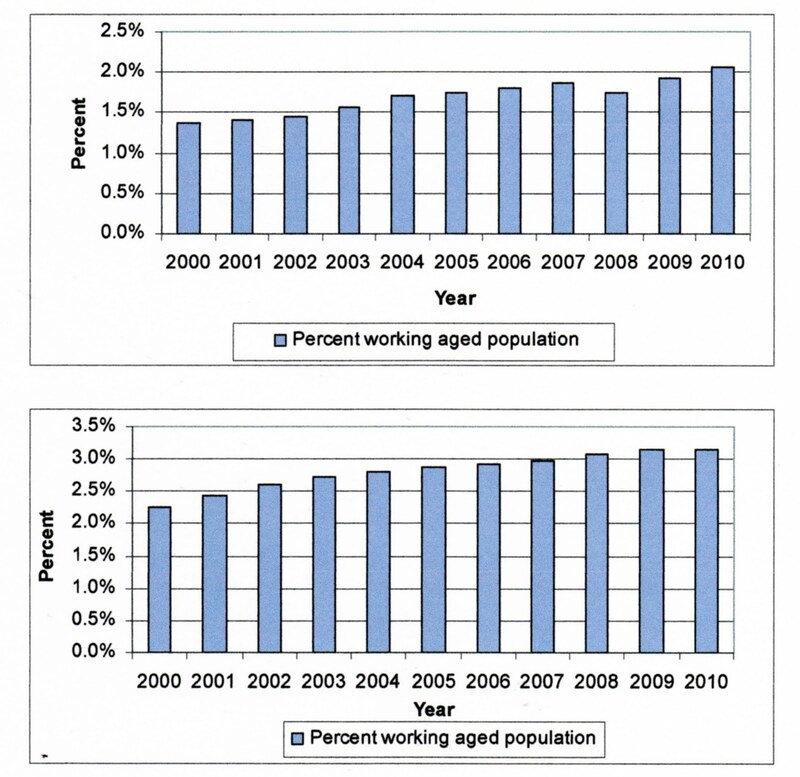 The first graph below represents the sickness benefit; the second the invalids benefit. The problem is multi-faceted. First we have to acknowledge (as the UK and Australia have) that the disability rolls have taken on many people who should have been on the unemployment benefit. That is a start and shifts the problem rightly into being one about jobs and not health. Then the mental ill-health juggernaut will require some honest assessment. Instead of spending extra on mending people (which we simply do not have to spend) a redirection of cash assistance into other forms of support, rehab, shared living expenses and accommodation etc is needed. The living in the community experiment has failed for an unknown number. There are people who, I can only repeat myself, are genuine cases and do not deserve to be stigmatised for their dependence. Too many are not. And the easy availability of benefit income has assisted them in causing their own 'incapacities'. Oh Good Lord. Yes, out loud I said it to no-one but myself. I can't stand this world some days. Or, what is it really? I can't stand all the attempts by governments to 'fix' things. Now they are going to fix kids. You just feel like you are suffocating from their snow-balling social engineering. I am silently screaming. BECAUSE EVERY TIME THEY TRY TO FIX SOMETHING THEY BREAK SOMETHING ELSE. Why can't they just leave stuff alone?? I made enough profit from my exhibition to fulfil a recently stirred ambition to get back to flying. As I haven't exercised the privileges of my Private Pilot's Licence for just over ten years I had to study and resit Aviation Law which I have just accessed the results of below. Yahoo. My memory may not be as lacking as I sometimes think. Having completed the arduous medical exam and confirmed that my heart is fine (although at my age, in the second fifty year period, the certificate only remains valid for 2 years) all that remains is to go and do some flying; brush up on forced landings and stall recovery, sit a Biannual Flight Review and bob's your uncle. Talking of bob, Robert can't wait. His interest in aviation is very strong. I shouldn't be surprised. He is my son. When the Conservatives were elected I felt disinterested because on my reading of it they didn't look very different from National. Too close to the centre to be of any use. “This figure's wrong,” Gordon Brown interrupted as I began to explain my Welfare Report to him. He leaned threateningly towards me, jabbing a stubby finger at a table in my draft. I looked at it. “No it isn't,” I replied. This was becoming unproductive. I tried to break the impasse. “I'll make clear that it's a gross figure, if that will satisfy you,” I proposed. “Yes, yes. Do that,” he growled. I was in his Treasury office in February 2007. I had been asked by Tony Blair and then work and pensions secretary John Hutton to write an independent report on how to reform the welfare system. They were happy with my recommendations: now I had been sent to explain them to Brown. It was a surreal encounter. The changes I was recommending were genuinely radical. Yet as our argument veered on for the next half-hour, we went from one inessential detail to another. Try as I might, I could not get him to discuss matters of principle. After this bizarre softening-up exercise, he dumped me into a room full of officials and special advisers, who demanded that I make change after change to the report. In the end I managed to publish the independent report that I wanted to: one that championed a major effort to roll back the number of people dependent on benefits. In particular, it recommended that substantial resources be directed to helping those 2.6 million people who had been parked on Incapacity Benefit, with the investment financed from the resulting savings to the benefits bill. When the economic crisis erupted in autumn 2008, the Government's response seemed to show all the top-down characteristics that have failed us over the past 30 years. Gordon Brown had clearly not accepted the reforming principles behind my outcome-led proposals — not surprisingly, given his lack of interest in them during our bruising, nit-picking encounter. And even where Labour had accepted parts of my approach in principle, the pace they proposed would be terrifyingly slow. They were looking to pilots covering less than 20 per cent of the country — leaving many people without any serious support. So I was enthralled when David Cameron and George Osborne asked me in February 2009 to join the Conservative Party to help them develop the ideas in my report into real, nationwide policy. They were determined that a Conservative government would launch the long and difficult task of rolling back the extraordinarily high levels of dependency that have developed in this country. Today the fruits of that work are launched in a new welfare contract for Britain. Its principle is: do the right thing and we will back you; fail to take responsibility and the free ride is over. As well as using the principles behind my report to help millions of people who have been abandoned for too long, within six months of taking office we will introduce new sanctions for anyone who refuses to look for work. That way we can have a welfare system that is firm but fair, and we can end Britain's dependency culture. Gordon Brown clearly doesn't want to change the system: we need a change of government to get the job done. New Conservative PM David Cameron has appointed Labour's ex-welfare minister Frank Field as 'poverty czar' in the UK. This is big news for anyone interested in welfare reform. Frank Field is above all a realist. He has better grip on what is causing poverty in countries like the UK and NZ than any other politician I can think of. For a short time he was welfare minister under Tony Blair but there was a falling out with Gordon Brown and he has spent the last few years on the back benches. But he may be too plain-speaking for the new Tories. "I've always believed in a causal link between benefits and the number of single mothers. We've got to change so that people don't become single mothers. For some, they become single mothers by accident, while for others it's a deliberate choice." "We have to be careful with this claim of a causal link. When we are giving benefit to the single mother, we are not giving it to her, it's to the child. if you want to end child poverty, then you have to give benefit." The contrast between the columns written by Deborah Coddington and Kerre Woodham in today's Herald on Sunday strongly marks the split between a pragmatic view and a reactionary view. Strangely it is Woodham with whose view I identify. She believes not a great deal has changed over time in relation to young people drinking to the point of death and that kids will always do dumb things. Coddington, on the other hand, believes that the drinking is far worse and the state has to do something. Both columns are written in the aftermath of the tragic death of young James Webster. Having a 16 year-old son brings me a little closer to the issue. Nevertheless I am sick and tired of hearing and reading about the scourge that is alcohol and young people's relationship with it. Not because I like a drink or two, especially bubbly, but because the problem isn't actually about alcohol. Teenage years are amongst the riskiest. That's part of the human cycle and human condition. And nobody can expunge that reality. Young people are busting out and they lack judgement. There are some aspects of life that simply can't be changed. Deborah says that she was lucky her kids survived. Well, not really. The overwhelming chances are that our children will survive adolescence and early adulthood. Except in times of war, when the risk-taking nature of the young was harnessed and celebrated, that is blessedly also immutable fact. Not a matter of luck. The best parents can do is know their children; make home a place their children want to be; be people their children can trust, or at least be some sort of anchor for them, and teach their children that they don't have to run with the crowd, don't have to get involved with doing stuff they actually don't want to do and, for that matter, neither should they try to coerce others against their will. After that it is in the lap of the Gods.